Want to know how to live overseas? That’s what an American writer told me recently when he heard I’ve lived overseas in eight different countries. These days I know not to argue with that type of comment. I may nod and smile but it makes me feel sad because I could sense his regret and I knew that he could live overseas if he really wanted to. I know that you can too. Not everyone dreams of the nomadic lifestyle and living overseas, not everyone is ready to live free, to give up their comfy couch and cozy lifestyle. But if you do dream of moving or living overseas for a short time or longer and you want to make it happen read on. If you have a travel dream and you want to get old with no regrets this is for you. I admit I am lucky, and I’m so grateful for all the experiences living overseas has given me, but maybe, just maybe, there’s more to it than just luck. Of course, I was lucky enough to be driven to follow my passion for travel and living overseas, even though it meant disappointing my family and standing up against social pressures to conform. Sure, I was lucky that I studied french and trained to teach english as a foreign language so I’d be able to get work overseas almost anywhere in the world. Certainly I’m lucky that I can control my fear, take what many see as crazy risks then pick myself back up even when things don’t work out. This is the hard part but don’t over-think it, you can always go somewhere else if you go somewhere and it doesn’t work out. You can choose anywhere in the whole wide world but when you start researching and really thinking about living overseas seriously you’ll naturally chose countries it’s possible for you to live in permanently or semi-permanently. Think about the practical options like how long you can stay and if you can work there. If you need to work overseas don’t expect to earn much, you want to look at living overseas as a learning opportunity, not a way to boost your retirement fund. If you can’t work overseas in your chosen destination think about how you can save up to finance your stay and how long you’ll be able to spend there. Understand that opportunities will come up when you live overseas that you just can’t discover before you arrive and settle in. Much as we love them your friends and family may be afraid of being separated from you, afraid that you may fail or worried that they will miss you. Confide in people who understand your dream to live overseas and have done similar things themselves. Then get ready to face your own fears and follow your heart. In case you’re wondering where I lived and how I did it here’s a summary. England – Where I was born and lived until 1986. France – I’ve lived in France three times. In Bordeaux where I worked as a nanny, in Marseilles as a teaching assistant and in Paris as an english teacher. USA – Nannying in Connecticut (still one of my best jobs ever) and in Atlanta where the Mucho Man was working as a consultant. Zimbabwe – Teaching english and maths. My maths isn’t great but they were desperate. We focused on the english teaching. Laos – I was supposed to work in Thailand but Bangkok was too hectic for me so I found a teaching job over the border in the Lao capital of Vientiane which is much more mellow. New Zealand – The Mucho Man and I applied for residency because we wanted to settle down. I worked as a consultant then set up my own web design company in 1998. Costa Rica – Adventure called. We told all our friends and family we were moving to Panama because the thought of us going traveling round Central America with three kids, no spanish and no income made them anxious. But in the end Costa Rica was the best place for us, it has more wildlife and that’s what we loved most about our time in Central America. Australia – We moved to Noosa in 2009 for an easy life and safe place to raise and educate out kids. Life is good but adventure still calls. We won’t move or live overseas again for a while as our youngest child is only seven but, when all the Candy kids leave the nest, I often wonder where we’ll go next. But this isn’t about me or where I’ve lived or would like to. It’s about you and where overseas you want to live. Now’s the time to stop thinking about how lucky other people might be and to start believing in, and making, your own luck. That’s how you can stop thinking about how to live overseas and start making it happen. Have you got any tips on how to live overseas? If you lived overseas where would you chose? Very good advice. I will forward this to my stepson, who is one of those people who dream of living overseas, but who always has some reason for not being able to do it. Thank you Chartreuse for spreading the word, that’s the best recommendation I could have for my writing. And to Chartreuse’s stepson if you’re reading this one question: if you’d like to live overseas but now isn’t a good time when will be? Go now, as soon as you can – you can do it and we are cheering you on. Our kids have been with us and I have one that has a us uk and australian passport! i now run a relocation company in Sydney helping families move here!! That’s a great passport collection – we only have two passports…. so far! The Internet even means many jobs can be maintained from anywhere in the world, hence the huge increase of people living and working as digital-nomads from opposite ends of the globe to where they’re ‘from’. Even keeping in touch with family is a breeze what with Skype – and its free!! Ah Linda, the voice of experience. It’s so true, taking those challenges does truly fire you up and yes, Skype is amazing, I remember living in Africa and the only place I could call home from (the UK) was in hotels which cost a fortune so I could only speak to my family about once a month! Ah so true and love that you quoted yourself – no one is more intersting than you:) The best thing is they do that for me even if I don’t actually go there. Just reading about exotic places or looking at photos is inspiring. To flick through a travel magazine or watch a documentary of some far-off place can transport you in an instant, even over a cup of tea. Human beings can choose to be brave, leave the excuses behind and maximise every moment. The final result is a life well lived! I’m living overseas right now, and have most of my adult life. I love living in other countries. For me it was “easy” because my husband’s job takes us there, but that too is still a choice, because he could just as well be employed at the headquarters and stay put. Something I read once (maybe it was in a Deepak Chopra book) really hit home for me. I’m paraphrasing here: “We are all trapped in a prison of our own making.” The bars, of course, are our perceived limitations and excuses. Packing up and moving overseas, as exciting and glamorous as it may seem, does take a certain amount of breaking out of our own prison, or comfort zone, but it is up to us ourselves to do it. Ah, and you have so many great travel stories to share because of all those experiences. Glad we’re all trying to liberate ourselves here! I was the child whose parents moved all over the world ( I was even born ‘overseas’ :) ) – we got ‘stuck’ in Australia because my Dad found his dream here… and much as I love Australia now, I hated it when the journey ended for our family. Living overseas is easier than many people think. All it takes is a mindset shift to know that anything is possible. We have just moved to Spain for the next 6 months with our two young kids, drawing upon an income from our online business and a redundancy payout. Too good! I didn’t know you live overseas! Start nodding, politely, cause here it comes! Great to see you here, and yes, I am blessed;) Hope you are too! From the time I was 16 or so, I dreamed of being a vagabond world traveler. Well, that didn’t happen because I moved from a mid-western state to California and started university. I signed up to do a year abroad in Italy… only to meet my future husband immediately after, so I cancelled the trip! As I studied English and creative writing, I dreamed of being a travel writer or National Geographic correspondent, then switched my major to art/design, and put writing on the back burner. But the almost 6 years we spent preparing to move to – then living in – Costa Rica with our 2 kids, made all the waiting to live abroad, worth it!!! So my best advice is: never give up on travel the dream, if you have it, and find a way to make it happen. 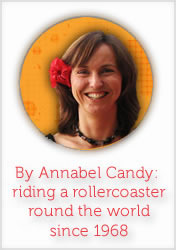 Annabel you are great resource, inspiring people to find creative ways to truly broaden their horizons! I’ve had the pleasure of finding your blog and reading it as I have time. Sadly, I’m one of those people who can’t seem to just take that next step and go. Unlike many people who do go overseas to retire or can afford to just pick up and travel to their hearts content, I seem to be stuck. I think it’s called information paralysis mixed with financial destitution from a divorce. I research and research and after 3 months of this feel like I’m in a bigger hole or dumber about the whole thing than when I originally started. I want to move from the US – permanently. Unfortunately, I’m not financially successful, I’m still in the beginning stages of learning to be a writer/blogger (which I decided to do as a way to fund my overseas life) and maybe a healthy dose of uneasiness. I’m certain that I want the adventure and to live off my wits (i’ve managed to keep myself alive here for 41 years) and to meet new people and see new places but I’m uneasy about getting there and then having to come back and be worse off than before. Once I go, I don’t want to have to come back. I’ve been told to just go get on a plane and go. My question to you is: Is that reasonable advice? The mountain of visa/residency/etc information makes it seem that just packing a bag and moving to another country is impossible – especially if you’re not already financially fluid. I’ve never been financially motivated or rather my life has never revolved around the pursuit or accumulation of wealth. As long as I’ve had enough money to do the simple country boy things I do I’ve been happy. I know it’s smart to have some sort of perpetual income to fund a nomadic lifestyle but darned if I can find one that doesn’t cost an arm and a leg to get into in the first place. So, again, is it possible to save up for a plane ticket to x and get there and be fine or what do you recommend? I trained to teach English as a foreign language so I could get work almost anywhere. As this is your first big trip I think you’d be better off having the safety of going to a known place and job. Maybe you could find a caretaking job or something similar? Once you are in a place it’s so much easier to find opportunities for work in exchange for food and accommodaton. What else do you really need? Annabel, I’ve personally been living overseas in some capacity (teaching, traveling, etc) since I graduated university. I feel it’s more of a personal decision than anything else. I know a lot of my friends back home make comments about wanting to do it as well, but when it comes to planning and execution their behaviors speak otherwise. I feel half the battle is just deciding you want to go and then taking massive action to make it happen. I’m six figures in debt from college and can’t find a job. I don’t think it’s an excuse if I’m doing everything I can to get one but I think I need to find some source of income to at least buy the plane ticket. Any suggestions? Life is about choices. There are those that choose to live overseas and there are those who choose not to. Granted some people have commitments that others do not and different obstacles to overcome in order to chase their dream but I absolutely believe that if you want something enough you will make it happen. Well, this makes me want to rethink of living overseas. Amazing how you’ve stayed in all those countries for a time. This is an interesting read. I’m on the fence about moving overseas from the UK. My husband would like to move to Australia as his dad moved there a few years ago. It would mean leaving his mum in the UK but she is 180 miles away from us now anyway. For me, I’d be leaving all my (large) close family. We don’t have kids yet but would like some in the next couple of years. I would love to give them the best quality of life but I’m so indecisive I don’t know if I should just just take the plunge or ‘wait’ until I can truly decide for myself….. he may be waiting a long time!! Hi there, I came across this blog while doing a web search about moving overseas. I am 32 and have two children, 2 & 4, and am wanting to move overseas as I know there is sooo much more out there in the world to discover. My husband on the other hand doesn’t want to move at all. Seven years ago I gave up my teaching job here in Australia to move to New Zealand with him for his work, I didn’t want to travel at the time but did it for him. We stayed for a year and fans back to get married and start a family. I now realise how much easier it would have been to do more travelling back then, but it’s only now in the last 6 months or so that I really want to get out and explore. I think i hzve dobe thing backwards….i wanted kids in my mid 20’s and want to travel now at 30! Is it really that difficult to start over with young children? While we don’t own our home we do have two houses and own both cars do I would happily sell cars and one house (rent the other house out) so that we could afford to set up in a new place. I guess when there is only yourself to worry about the decision can be easier, if it was just me i would book my plane ticket tomorrow! Do it:) Your kids are still young and will be able to cope with anything though you will still have to work on the hubby. Maybe sell it as a short term thing to see if you like it. My kids are 14, 11 and 8 now and I am really feeling stuck as I need to get them through high school and it’s harder to move them around when they’re older and have real and valid opinions on the matter. So that’s why I say go for it. Good luck! as i never really travel much, would you mind to give me idea where else would be good option to move? I could really do with some advice please? I am from the UK and I finished university last year and would like to get into the animal industry. I stayed in Thailand for 3 months last year and loved it. I want the warm weather and chilled lifestyle. However, my boyfriend does not want to move anywhere yet, maybe in a couple of years but I want to go now. I have two dogs though and I am currently just doing supply teaching work which I don’t like and I am deeply fed up. There is nothing here for me. Do you think I should just take the plunge and move away with my dogs? Is it too risky? I have been looking at jobs abroad and applying but there has only been one reply in which they said I need to be residing in that country! It’s much easier to get work when you’re in the country so best to go there. You will have to leave the dogs and boyfriend behind though. There are so many Thai dogs in need of adoption you will find others and your relationship will either work out or not irrespective of the travel. I read your blog on How To Live Overseas and Not Have Regrets and it spoke to some kind of indecision I’ve been grappling with for several years.. I don’t know if I’d be able to gauge your opinion, but I’m a New Zealander, have a sort of obsession with living in New York (I say obsession because it was just a fleeting idea made fixation after the death of one of the Beastie Boys, my favourite band growing up that I never got to see live), and turned down an opportunity to take a graduate US work visa a few years ago. In the time since, I entered the green card lottery and got through to the interview stage, so If I stick around in Auckland long enough, I’ll have the chance at a green card August/September this year, at which I’ll get to try move to New York. Though in the meantime, I’ve been considering the UK and London as well, and I would quite like to be there for festival season this year (and perhaps stop by New York on the way for a tribute to the Beastie Boy which takes place may 3rd). So I now have not much time to decide, do I stay around in Auckland (which I’m pretty bored of) another six months and try for the green card visa? Or do I go to the UK on a 2 year work visa, where some of my friends already are? It’s a complicated and messy decision but I’m just asking as many people as possible hoping I can come to some conclusion. I’ve never been to New York or London, I haven’t even been out of Australasia, and I have many dreams, but seem to have got caught in a cycle of indecision, while I sit in an entry level job in Auckland. Go to London :) Come back to Auckland for the interview. You can save that return airfare back to Auckland of $2000 working in London as long as you treat it as work and don’t waste time getting a job. Then when you go back to London after the interview you can chill out and spend time visiting Europe and go to the US after that. An alternative would be to hop over to Australia and work here for six months. It’s a cheaper airfare back to NZ. Whatever you do get your own domain name (eg. http://www.hamishexplores.com) and write all about it. Keep blogging and yes remember you’ll be happy whatever you do. Thank you for all the positive I have been able to absorb here. I am an Australian Brit with dual citizenship. Although I arrived to live in Australia with my family when I was 7 years old, I have been able to travel this wonderful Earth considerably. But never my return each time without regret. Regret via wonder from wander for the able of calling another country, home. Upon returning, I have always had the yearning to want live in France or neighbouring region. I haven’t travelled for some years now from my partner (whom I met overseas) and I having two young children, yet never before has my desire to live abroad been greater. Not so much for myself, but as much for myself and family to gain from the new and the culture broadening of mind for our children. Different cultures, languages, arts, history, foods, and certainly no more the cost of living than that of Australia currently, from all the research I have done. Presumably, the worst problem we many may consider from the mundane security of our habitual systematic lifestyles, is failure, or struggle upon a foreign soil with less security from that of our native land via places in which to turn for help. Without children, is such a gamble only the gain by wisdom for any couple or single person. But I have found every brick in the wall to be laid, is that from all the issues that ‘may’ be created for my girls from struggle with income (courage) … Thus, my reading here what some have written re internet related business, does it certainly shine a different light upon that wall for greater consideration. Thank you! Previous post: Is it Safe to Travel to Japan? What You Should Know One Year After the Tsunami.